15088 This lovely three-legged half-moon table is the very definition of functional beauty. Add a vase of flowers on top of this charming table to invoke thoughts of Paris in springtime, or designate it as the perfect landing spot for your keys next to the front door. 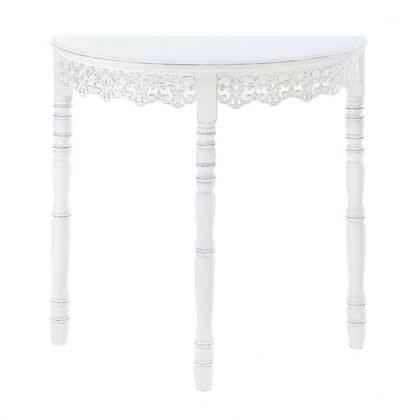 Mixing classically shaped legs, an intricate front apron design, and shabby chic finish, this table is a gorgeous accent for any room. Item weight: 10.2 lbs. 31½" x 15¾" x 30½" high. 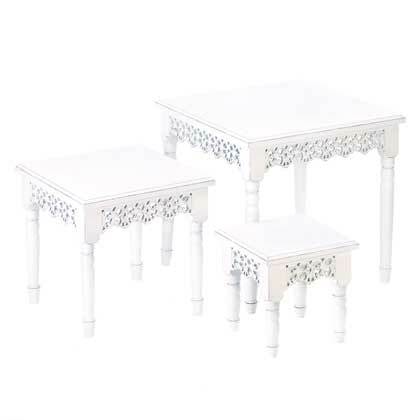 15089 There’s no limit to what these enchanting nesting tables can do for your room! Tuck the smaller two underneath to create visual interest, stagger them to make a stepped display for plants and flowers, or place them near seating areas to use as side tables. The intricate cutout design surrounds the tables on all four sides and the white shabby chic finish makes them look like longtime treasures. Weight 25.6 lbs. Large: 21½" x 21½" x 20" high; medium: 16¼" x 16¼" x 15½" high; small: 11¼" x 11¼" x 10½" high. 15092 Organization can be glamorous! 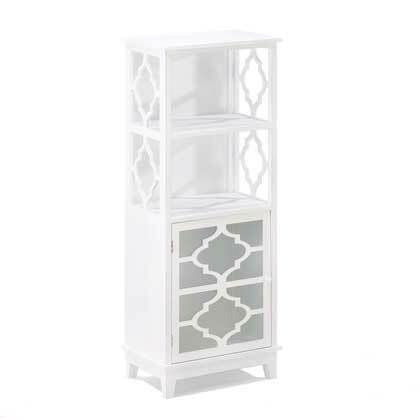 Frosted glass covers the bottom half of this modern storage cabinet while two open shelves on top are at the ready to showcase your style. It looks great in the bathroom stocked with towels and necessities, and is also an attractive way to display collectibles in any room of your home. Item weight: 27.9 lbs. 18½" x 12¼" x 47" high. 15090 Just say no to boring tables! 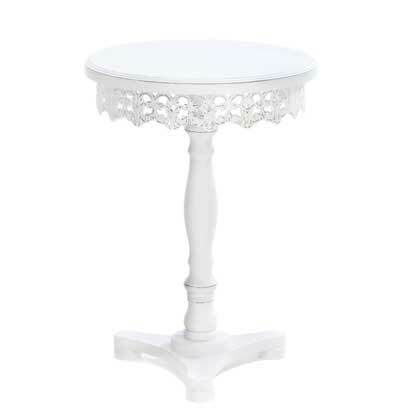 Add dramatic flair to your home with this table’s shabby chic finish that perfectly highlights the decorative cutwork around the base of the tabletop. Weight 6.3 lbs. 15¾" x 15¾" x 20½" high.